2010. Rowman & Littlefield. Hardcover. 253 pages. I will start out this post with full disclosure: Janel Atlas, the editor of this book, is a friend of mine. She did not ask me to talk about it on my blog. And I’d probably hesitate to blog about a friend’s book in most cases, but the book’s subject overrides any hesitation here. 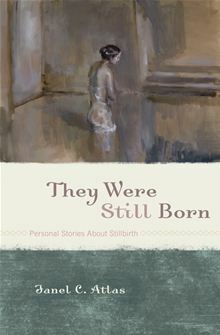 As the title indicates, They Were Still Born is a collection of personal stories about stillbirth. In the chapter, “What We Know about Stillbirth,” Dr. Ruth Fretts acknowledges that “what is called a stillbirth has been subject to much national and international debate” but it is currently defined, in clinical terms, as fetal death after 20 weeks of gestation. They Were Still Born starts with a foreword by Elizabeth McCracken and an introduction by Janel Atlas. What follows are twenty-one stories of loss. Most stories are written by the mothers of stillborn children, but there are also stories by fathers, and one by a grandmother. These stories are understandably similar due to the nature of the loss: hopeful pregnancies ending with devastating, unexpected stillbirth. But the details and the ways that the writers capture the loss are varied. The second part of the book includes the chapters: “Honoring and Remembering Your Baby”; “Creative Expressions of Grief”; “What We Know about Stillbirth” by Dr. Ruth Fretts, an obstetrician-gynecologist and an assistant professor at Harvard Medical School; and “Emerging Research”. The book concludes with a list of resources and organizations. I am not quite the reader for whom this book is intended, so I looked for insights on how one can support a family who suffers such a loss. Something I already knew: don’t offer platitudes, even if they are well-intentioned. Saying things like “You’re young and can have more” and “It must not have been meant to be” cause pain rather than comfort. From the stories shared in this book, one of the main desires of parents is for their baby to be remembered. So, one can support by remembering their baby, by remembering their grief. While reading this book, I was struck by how much grief is another country. The world is completely different for these grieving parents: triggers for pain are everywhere. There’s a story in the collection by Monica Murphy LeMoine that comes to mind called “A Plan Gone Awry”. Some months after losing their baby Zachary, Monica and her husband go on a weekend getaway to a hotel. On the elevator ride up to their hotel room, Monica runs into a group of women from the Expecting Parents Meet-up Group that she had founded two years before. A new, unaware member asks about Monica’s child, and Monica replies “Oh, it didn’t work out” and shortly thereafter the couple exit the elevator. Monica tries to keep to the original romantic plans, but it’s been thrown off now. My desire to define my loss as completely unique has been sated, and in its place yawns the need to be supported, surrounded, and understood by a community of families who have endured the loss of a child, whatever the details surrounding that baby’s death. 1922. Virago. Paperback. 361 pages. In a nutshell: Two lonely Londoner housewives, Lottie and Rose meet each other after reading a classified ad about an Italian castle for rent in the month of April. They discover a shared dream of vacationing on the coast of Italy. To share the cost of renting the castle, they advertise for two more female renters. Beautiful young Lady Caroline Dester and the elderly widow Mrs. Fisher respond to the advertisement. Each woman has her own reasons for renting the castle and for escaping their lives in London – and in the case of Rose and Lottie – escaping their husbands as well. I picked this book up because I’d heard good things about the author’s writing and about this book in particular. I’m not sure the plot would have drawn me in on its own. The introduction by Terence de Vere White mentions a “a flurry of contrivance” in some of the plot developments. And certainly, once the husbands, and the castle owner, start showing up in The Enchanted April, there is an element of contrivance in that. I think I forgive contrivance more in older books than in more recent books, perhaps a kind of snobbishness on my part? My favorite section of the book starts at the arrival of the women to Italy up until the first husband arrives to visit. I enjoyed the other parts too, but I think von Arnim’s insight into her characters’ minds is best showcased when the characters are becoming acquainted with each other and the castle. Almost all of them are in reflective moods. I identified with Lottie’s rapture on her first day in Italy. She absolutely luxuriates in the beauty of the location. It reminded me of the energy and wonder I felt on the first day of my vacation to San Francisco last year. After all the planning, I was finally there experiencing it. Once more she had that really rather disgusting suspicion that her life till now had not only been loud but empty. Well, if that were so, and if her first twenty-eight years – the best ones – had gone just in meaningless noise, she had better stop a moment and look round her; pause, as they said in tiresome novels, and consider. She hadn’t got many sets of twenty-eight years. I am about the same age as Caroline, and while I haven’t thought of my life as completely “meaningless noise”, I do sometimes wonder if I should have done it differently. I liked von Arnim best when she was describing the characters and their situations. I know the author loved gardens and flowers, but as I have little knowledge about flowers, her descriptions of the castle’s gardens were kind of dull for me. They just seemed to be name after name of flower type, and I didn’t find it evocative. One exception is that I thought the book’s last description of the castle worked very well, because of its emphasis on the characters’ absence. That’s about all the thoughts of The Enchanted April. I had a hard time writing this one for some reason, so I’m glad I’ve finally finished this post, even if I don’t feel fully satisfied with it. BAND Discussion: What Nonfiction Don’t You Like? It’s been a while since I have participated in the activities of the Bloggers’ Alliance of Nonfiction Devotees. This seems like a good time, as I’ve been having trouble writing my next book review post. Kim over at Sophisticated Dorkiness is the host for the BAND question of the month which is: What is one type of nonfiction you dislike and why? And, as an extra challenge (if you choose to accept it), ask your readers to recommend a book to try! I don’t read much in the way of biographies at all, but one type that I just don’t have the taste for is the entertainer biography/memoir. I can’t say that I actively dislike them; I just don’t see them as worth my time. I do have favorite musicians and actors and filmmakers, but I have a limited curiosity about their lives. I might read a brief bio, but I don’t really see myself reading a whole book about a musician or actor (or director, or dancer, or artist). I feel like those books are for die-hard fans of that person, and I’m usually a die-hard fan of the works rather than their creators. Memoirs of entertainers particularly make me wary. I suspect rampant name-dropping and the whiff of the ghost-writer. But I’m willing to consider recommendations. I could see myself being interested in an entertainer biography if the author did a good job with context: what were the places and times like during that person’s career? I could see myself being interested if it’s a biography that would be interesting even if one had little acquaintance with that person’s work. So have at it in the comments. Betimes next morning, that horrible old Lady Tippins (relict of the late Sir Thomas Tippins, knighted in mistake for somebody else by His Majesty King George the Third, who, while performing the ceremony, was graciously pleased to observe, ‘What, what, what? Who, who, who? Why, why, why?’) begins to be dyed and varnished for the interesting occasion. She has a reputation for giving smart accounts of things, and she must be at these people’s early, my dear, to lose nothing of the fun. Whereabout in the bonnet and drapery announced by her name, any fragment of the real woman may be concealed, is perhaps known to her maid; but you could easily buy all you see of her, in Bond Street; or you might scalp her, and peel her, and scrape her, and make two Lady Tippinses out of her, and yet not penetrate to the genuine article. She has a large gold eye-glass, has Lady Tippins, to survey the proceedings with. If she had one in each eye, it might keep that other drooping lid up, and look more uniform. But perennial youth is in her artificial flowers, and her list of lovers is full. ‘Beyond an impression that he is to sit upon my knee and be seconded at some point of the solemnities, like a principal at a prizefight, I assure you I have no notion what my duty is,’ returns Mortimer. Eugene is also in attendance, with a pervading air upon him of having presupposed the ceremony to be a funeral, and of being disappointed. The scene is the Vestry-room of St James’s Church, with a number of leathery old registers on shelves, that might be bound in Lady Tippinses. So, I decided to create a twitter account as a companion to my blog. I just kept seeing other book bloggers mention Twitter conversations and wanted to see what was going on. But now that I have my twitter account (my handle is @agoodstoppingpt) I don’t know quite what to do with it except lurk and read other people’s tweets. I am following almost 50 people, mostly other book bloggers, and about a dozen are nicely following me back. So tell me other twitter users, what do you like to use it for? What kinds of things do you tweet about and what kinds of tweets do you like to read? I would ask this on twitter, but I think I have more readers on my blog than on my brand-new twitter account. My last bunch of books have been fairly quick reads. I read a coffee-table type book called A Day in the Life of the American Woman: How We See Ourselves which was a collaboration of many female photographers. All of the pictures were taken on April 8, 2005 and they capture a diverse group of women; they are diverse in age, race, religion, career stage, sexual orientation, marital status, family status. Each photo or set of photos is accompanied by a brief snapshot of that woman in that time of her life. Very cool. I heard about this book on Olduvai Reads‘ blog. I also read the second Mouse Guard graphic novel Winter 1152. I liked how it showed more of the mice interaction with other species, and not just in a predator/prey relationship either. That said, the owl was pretty creepy as were the bats. And then I had also picked up Dead Until Dark by Charlaine Harris which is the first of the Sookie Stackhouse vampire series. I never have seen “True Blood”, the tv show that is based on the series. Apparently before I worked where I’m working now, several of my co-workers had decided to read this series at the same time. Co-worker Kim confided to me that the books are her guilty pleasure but also gleefully told me how much more ridiculous things will get in future books. Dead Until Dark was definitely full of cliches, such as almost all of the male characters being attracted to the heroine, but Harris does know how to write in a way that keeps you turning the pages. There is a scene near the beginning of Dead Until Dark, where Sookie has been hurt so badly that she realizes that she is dying that was actually rather poignant. Currently, I am reading The Enchanted April and quite loving it. 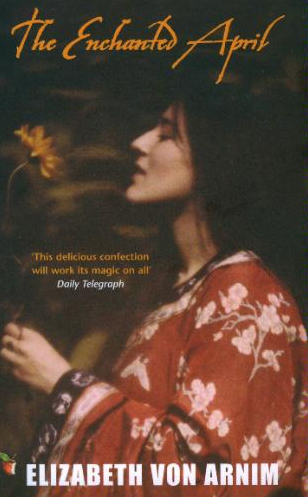 I also have Dave Cullen’s Columbine out from the library and Jo Walton’s Farthing still out. In non-bookish things, I’ve been watching season one of the show “Community” and it’s fantastically funny. I love the character of Abed especially, but the whole ensemble is great. I have a discussion post in mind for this weekend, on the subject of sartorial description in books, inspired partly by reading the Charlaine Harris book.